Sustainable, sophisticated, and fun, reusable beeswax wraps protect your food and the environment. Handcrafted in Massachusetts, these plastic alternatives are beautiful cotton fabrics layered with organic beeswax, jojoba oil, and tree resin. Lasting for at least 100 washes, they can also be used as a lid cover for leftovers or folded into a pouch for snacks. Multipack includes a size for all your food storage needs. Dimensions: Small: 8" x 8” x 0.02"; Medium: 12" x 12” x 0.02"; Large: 12"x 15” x 0.02"
I really love this product. The design is great and easy to use. The creative designs are a plus as well. Love these! So much better than plastic. Z Wraps founder and environmentally-conscious mom, Michelle Zimora, has always been the tinkering type, taking what was around her and turning it into something useful. In 2017, she wrapped her thoughts around reducing plastic waste and creating a better way to pack her daughters’ school lunches. What began with one favorite printed fabric and a whole lot of recipe testing is now Z Wraps. Michelle’s pretty-meets-practical food wraps are a wonderful alternative to plastic wrap or little baggies. 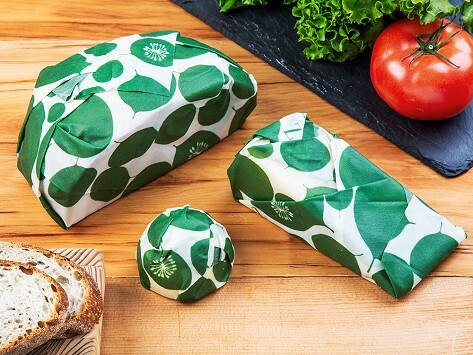 Made with cotton fabric that is layered with organic beeswax, jojoba oil, and tree resin, a wrap is reusable, washable, and handy for many food storage and packing tasks, from sandwiches to cut veggies to even being used as a lid for leftovers. Multiple sizes serve multiple purposes but all are sustainable, compostable, and beautifully designed.